New sweatband, birthday gift from my brother Keith, is helpful today as Barry Smith leads a warm & humid afternoon trek from his home, up Sligo Creek, and across to Northwest Branch Trail. Unlike last Sunday (2013-09-29 - Northwest Branch and Sligo Creek with Barry) this time we go downstream to Colesville Rd. 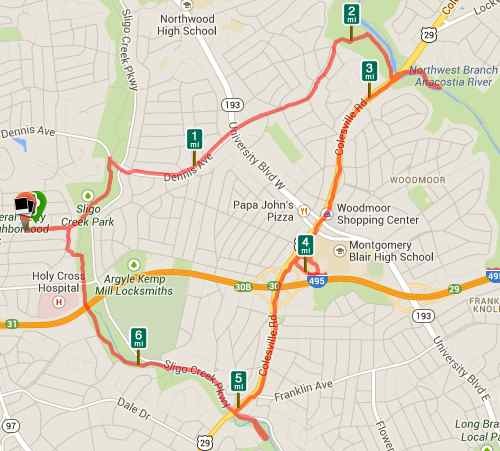 After a short additional scramble over slippery leaves and rugged rocks, we turn back, take the sidewalk along Colesville to Blair HS, run a lap on the oval asphalt track, and then continue to Sligo Creek Trail again, thence upstream back to our start --- whew!